This week, we're going to look at making Jungle, Basic Woodland and some Alien elements for the bases we made last week in Part 1. So let's get to it. There's nothing more evocative than the image of soldiers moving through thick jungle. Unfortunately, you don't see much jungle terrain on the tabletop which is a shame, as it's really easy to put together. First off, start with some 60mm flat bases, or any sort of base really, I've used large flying bases and even cut my own out of plasticard in the past. Avoid cardboard at all costs as it's prone to warping. In this example, I've added some milliput so that my bases don't look flat, but this isn't essential. Next gravel and seal them in exactly the same way as the area terrain bases and leave them to dry overnight. Once they're completely dry, paint them up the same way as well. Then, brush glue around the edges of the bases and cover that in static grass. Make sure you put something underneath them to catch the overspill so you can put it back into the tub once they're dry. When they've completely dried, you'll be left with something like these. Next up, you're going to need some jungle plants. You can buy these from GW, but I highly suggest you head down to your local pet shop. Pet shops stock all sorts of handy stuff for hobbyists, from various types of gravel to plastic plants, which is what we need for this project. These are a few packets of plastic plants I picked up from my local pet shop, I got quite a lot for a good bit less than the cost of the GW plants. Take your plastic plants and cut them up into individual plants. Then, simply glue the individual plastic plants onto your bases and leave them to dry. Once dry, you'll have something like this. Once you've got your area terrain bases and foliage elements together, throw them down on the table, add some models and you're ready to go. By far the most common foliage feature on the tabletop is the wood, whether it's the GW plastic woods or ones made from various hobby trees, or even scratch built ones. I'll be covering how to build your own trees in the future, but for this tutorial we'll look at how to base hobby trees as GW plastic ones already come with their own bases. First off, simply glue the tree to a round base, in this case a 60mm sentinel base, using some PVA glue. Then cover the base in gravel and paint it up in the same way as we did the jungle bases. Next, you'll need some scenic material such as static grass and clump foliage. Clump foliage comes in various colours and I find a mix of colours works best. Glue the static grass around the edges of the bases like we did with the jungle pieces. Once it's dry, add some clump foliage at the base of the trees using PVA. Once that's all dry, you'll have some very simple but very effective tree bases to use to make woodland area terrain for your games. Once on the table, they'll give you a great looking woodland scene. 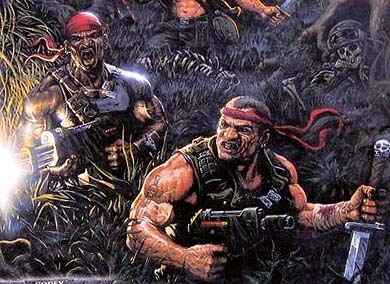 It's quite common to see woodlands on tabletops and even jungles, but the one rarity is alien terrain which is quite strange considering 40k is a science fiction game. Making alien terrain pieces isn't that hard, you just need to find the right materials. As a starting point, I highly recommend pot pourri, yep, that smelly stuff the women folk like to scatter around the house, it's perfect for alien terrain. First, pick out some interesting pieces that you think will work well together. It's best to get more than you need, so you've got plenty to experiment with when putting together the terrain elements. Once you've got a good selection, dip them in your watered down PVA and then leave them to dry. This will give them a protective coating, stop them from smelling and help with any painting you want to do. Once they're good and dry, gravel some bases as described in the jungle pieces and then glue on your Alien pieces. Once they're completely dry, paint up the bases and add some static grass. You'll also find that since they were dipped in PVA, you can quite easily paint the pot pourri if you like. As you can see, even on the typical green grass tabletop, they do have a real alien feel to them. And there you have it, a simple two part guide to creating a variety of heavy foliage terrain for your tabletop. I hope you've found this tutorial useful and I hope it inspires you to create some of your own. Great tips! Really liked the alien foliage one and has inspired me to start my terrain projects. Thanks and keep these coming. Very nice article Colonel! I especially like the look of the alien vegetation - that definitely adds a touch of sci-fi to the table. I'll have to give that a go! Very nice, especially the "alien" plants. Good stuff. I have just started using heavy 1 1/4"-2" galvanized washers with air dry modeling putty in the middle for trees or other small movable terrain features - oddly much less expensive for heavy metal washers ($14 for 50) than plastic GW bases! Great Article. I love the jungle foliage. Great article as always Col. The alien plant stuff is brilliant! Great writeup, col. I love it all! It all really inspired me to get more foliage for my arid map. As always Col. you have made an excellent post. These are excellent tips. Perhaps you could do something on desert terrain....I know, I know...what terrain do you find in the desert. However, if you could so something along these lines, I know that I personally would enjoy the article very much. Cheers guys, glad you liked them. Ironically, I prefer the jungle terrain to the alien stuff. I must do more and add them to my Eldar table. @Charlse Feduke - Excellent tip mate, I'll be using that. @Magilla Gurilla - I'll have a nose and see what I can come up with. There's a link to desert terrain at the top of FTW. It's quite a good tutorial, well worth checking out. @Bigred - I did mention it to RG a while back when he did a shout out for ideas, hope he finds it useful. I'll look forward to seeing the pics on Bols when the tables done. Thank you very much for this tutorial, I have all the materials and I'll start making foliage just this weekend.